Sydney: A vast and powerful cyclone made landfall on Saturday along a remote stretch of the northern Australian coast, bringing fierce winds and heavy rains amid safety fears for a small number of residents who've stayed in the area. A category 4 storm, with 5 being the strongest, Cyclone Trevor crossed the Gulf of Carpentaria coast at 9:50 am local time (2250 GMT) in the far east of the Northern Territory, near its border with Queensland state. 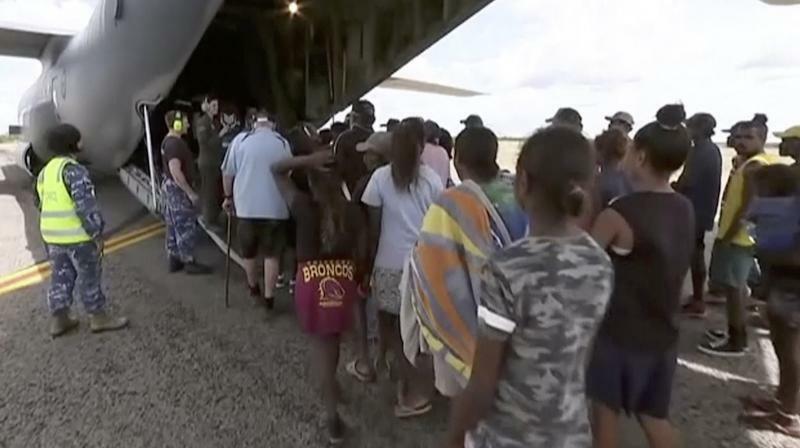 Most of the sparsely populated area has been evacuated, with more than 2,000 people put up in temporary accommodation in the Northern Territory capital Darwin, and the nearby town of Katherine. But with the cyclone bringing wind gusts of up to 250 kilometers per hour (155 miles per hour), and with flash flooding expected as heavy rains meet hard-baked lands recently hit by drought, authorities have issued safety warnings for the small number of people who have stayed put. Northern Territory Emergency Services spokesman Jason Collins said anyone remaining in Trevor's path needed to have supplies to last at least three days, to take shelter and stay away from waterways. "Turn around, don't drown. We may not be there to save you," he said. Residents of Western Australia state's coastal Pilbara region, which is also only lightly populated, have been warned to take cover. Cyclones are frequent in Australia's tropical north and rarely claim lives. But two such large storms as Cyclones Trevor and Veronica crossing land on the same weekend is rare.